Cleaning and reorganizing a house seems a much easier job than putting back together a life that has fallen to pieces. For Lucy Bloom, however, both present a challenge — as well as a huge opportunity for growth. If there’s one fact that Lucy Bloom knows, it’s that things are not people. Not only is that sentiment the title of her not-so-bestselling book, but she recently had to sell her house and essentially everything she owned in order to finance drug rehab for her teenage son, Ash. Even though her current lack of things isn’t a problem, she still feels unhappy and a bit lost. Her son is halfway across the country and has yet to so much as write her a letter, she lost her PR job, she’s sharing a room with a friend’s preschooler and her boyfriend broke up with her. The one thing that might have potential to restore balance to her life is a new job as a professional organizer. Unfortunately, Lucy’s first attempt at working as a professional organizer is not the easiest of jobs. She has been hired by the son of famed artist Marva Meier Rios to clean out her house. Marva’s house could easily be on the TV show Hoarders, and she shows little inclination to actually part with anything. Almost as difficult as Marva is her son, who insists that this task be completed with the utmost discretion so as not to damage Marva’s reputation — or his. There is more to Marva’s mess than simple attachment to items, however, and the secret she is keeping is something that will bring the two women together. Objects of My Affection is an immediately engaging book. Smolinski throws the reader straight into Lucy’s life, providing background in a way that is easy and natural. Lucy is vulnerable without being needy — making her an easily-relatable character. 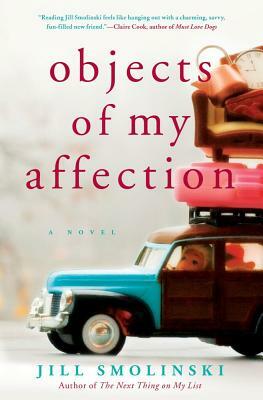 Equally intriguing is the plot of Objects of My Affection, which includes relationship issues, family secrets and personal growth. Smolinski has written a book that is both funny and smart, a novel that will keep you reading — and keep you thinking even longer.